The Parcels Search tab enables you to search parcel data anywhere in Florida in a variety of ways. You can search by owner name, mailing address, PIN, street address, sale dates, sale prices and more. Create simple queries by entering info in one field, e.g. last name or company name in the owner name field. Create complex queries by searching many fields, e.g. 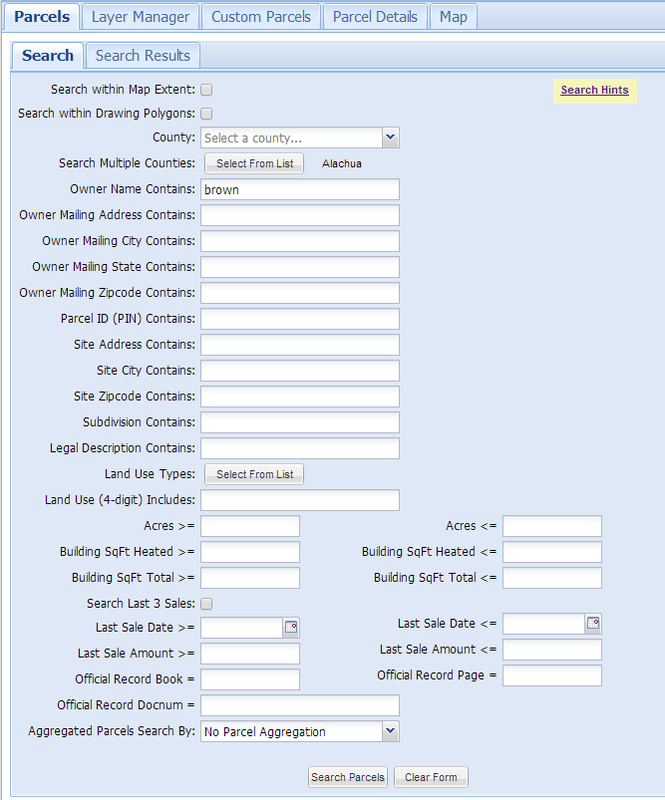 select land use codes, specify min and max acres, and define a geographic area to search. If you do not get any search results, remove some search criteria. It is easy to enter too much specific information to search on and get no results. This limits parcels searched to the current map area shown in the Map tab. You can use the map to zoom in to a specific area or neighborhood, then go back over to the search tab and check the box for "Search within Map Extent." This limits parcels searched to a polygon created using the Drawing Tools. To use this option, either create a new drawing project first or load an existing drawing project. This option only uses polygons from your active drawing project and you can draw more than one polygon. See the Drawing Tools section for more info. Select a county to limit the search to. Searching one county is much faster than searching multiple counties or the whole state. Aggregate parcel searches go much faster when searching multiple counties or the whole state. Select one or more counties to limit the search to. The more counties you select and the more parcels each county contains, the slower the search will be. Owner name formats vary between counties, e.g. lastname firstname OR firstname lastname, etc. You can enter a partial owner name. Capitalization and punctuation are ignored. If you are having trouble finding an owner name, try entering less information, i.e. a last name or trying reversing first and last names. Owner mailing address is just the street address portion, not the city/state/zip code. You can enter a partial owner mailing address. If you are having trouble finding an owner mailing address, try entering less information, i.e. a partial address. Less is more - if you do not find the city, try less characters. You can enter a comma delimited list of zip codes. You can enter a partial zip code. PIN and ALTKEY are searched. You can enter a partial parcel ID. If you are having trouble finding a PIN, zoom in to a small area of the county you are searching in. Then use the "i tool" to click on a parcel. Inspect the PIN format, and make sure you are searching using the correct format, i.e. some counties include dashes in the PIN and others don't. In addition, Section / Township / Range info is sometimes re-ordered in the PIN. If you are just searching for an address to zoom to, it is better to use the address search bar above the the map. The address search bar is much more forgiving on the format of the address, whereas using the parcel search form requires much greater accuracy in specifying the address. Searching for addresses in the Parcel Search Form is better for finding a list of parcels along a street. Less is more - try entering just the street name with no prefixes, etc if you are having trouble finding a street. Do not enter a city, state or zip code. Prefix directions are abbreviated, e.g. North is N.
Street modifiers like Avenue are abbreviated, e.g. AVE. Vacant land may or may not be addressed, it varies by county. You can enter a partial city name. Not all counties have searchable subdivision names. Less is more - try not to be too specific at first. You can enter a partial subdivision name. Enter a partial legal, the shorter the better. Formatting of a legal description can vary. You can usually find subdivisions by searching the legal for subdivision names. Property Appraisers assign Land Use type codes to each parcel. The code represents the dominant land use for that parcel. The Florida Department of Revenue (FDOR) defines the main land use categories for the state. Individual county Property Appraisers also define more detailed codes that vary between counties. This search option provides a uniform land use classification to search across the state. This is the two-digit Florida Department of Revenue (FDOR) version of land use codes available statewide. 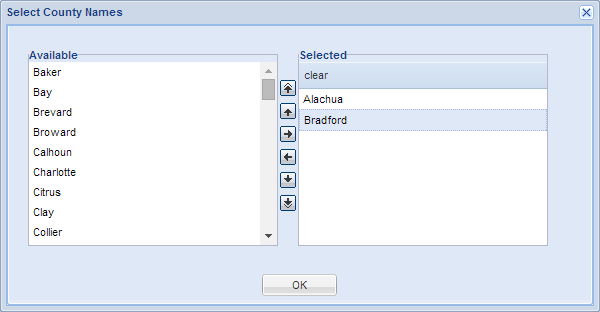 Multiple land use codes can be selected. Individual county Property Appraisers usually define more detailed four-digit land use codes. The first two digits are standardized statewide, but the second two digits are unique to each county. You can enter a comma delimited list of land use codes. Four-digit codes are not available in every county. The number of codes and description of each code varies widely between counties. A sum of total heated (living area) square feet of all buildings on the property. Search for a range of values, set a minimum value or set a maximum value. Not available for all counties. A sum of total square feet of all buildings on the property. Includes garages, covered porches, etc, i.e. non-heated space. A sum of adjusted square feet of all buildings on the property. Adjusted square feet is calculated based on heated and total square feet using a formula defined by the Property Appraiser. Minimum year built of all properties on the parcel. Actual year built is year of original construction. Maximum year built of all properties on the parcel. Year built effective is year of improvements to a building. This option provides searching the previous 3 sales of a parcel for a match. For example, if you want to find properties sold between 5/1/2017 and 7/1/2017 and its currently 2019, there could be more than one sale since 7/1/2017. You would miss these sales unless you searched the same parcel for more sales transactions. Search sale date by minimum date, maximum date or a range of dates. Search sale amount by minimum amount, maximum amount or a range of amount. Search for sale amounts greater than $100 to help find qualified sales. Combine with Search Last 3 Sales to help find qualified sales. Search by Book and Page numbers assigned by the County Recorder. Some counties have switched to using only Document Number. Search by Document Number assigned by the County Recorder. The purpose for aggregated parcel data is to quickly search large tracts of land consisting of multiple parcels. The aggregated parcel data contains parcels over 9 acres. Parcels aggregated by county and available statewide. A great way to visualize how aggregation works is to explorer the layers in the Map tab. The default search option is No Parcel Aggregation. Parcels are aggregated in three different ways. Aggregated by book / page or docnum. Do not use this to search for individual sales of small parcels. Aggregated by owner name county-wide. Aggregated by owner name, where contiguous parcels are aggregated by owner. Other parcels with the same owner within the county are separate entities (polygons).